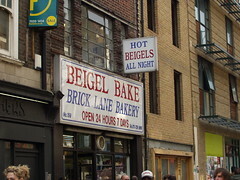 Famous bagel bakery on Brick Lane. Open 24 hours a day, 7 days a week. Sells filled as well as normal bagels. The hot beef is quite good (and can be had with English mustard) as is the cold herring. Quite cheap. James eats here occasionally. A hot salt beef beigel with mustard and pickles costs between £3 and £3.50 seemingly randomly (I believe the mustard and pickles are charged as extras, but often they seem to forget or charge different prices). They are delicious, filling and almost bacon-y in savoury satisfaction. A dozen plain bagels were £2.18 as of April 2007. Also sells a variety of cakes, sweets, and breads and offers salt beef on its own (presumably for making your own beigels at home). Note that there's another bagel shop just two or three doors south of this, which is not nearly as good, so be sure to check the name! Last visited by bob, some time in 2016. Last edited 2018-07-31 09:16:18 (version 27; diff). List all versions. Page last edited 2018-07-31 09:16:18 (version 27).